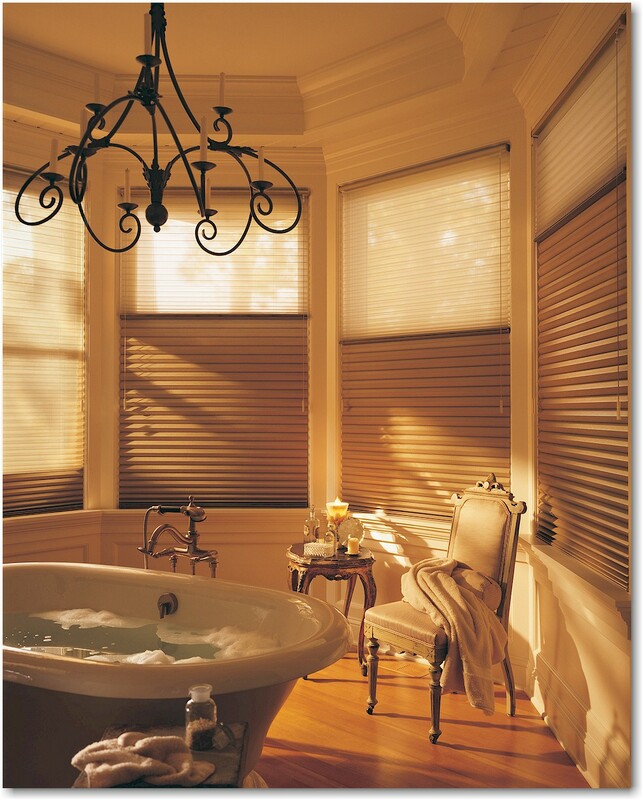 Austrian shades bathroom The peaked ceiling line, chandelier, and stone tub edging all combine with these Austrian shades topped by an arched cornice to create the lap-of-luxury look so many of us desire. Feel pampered and magnificent the moment you enter this majestic bathroom. With this kind of ambiance, it may become your favorite room in the house. 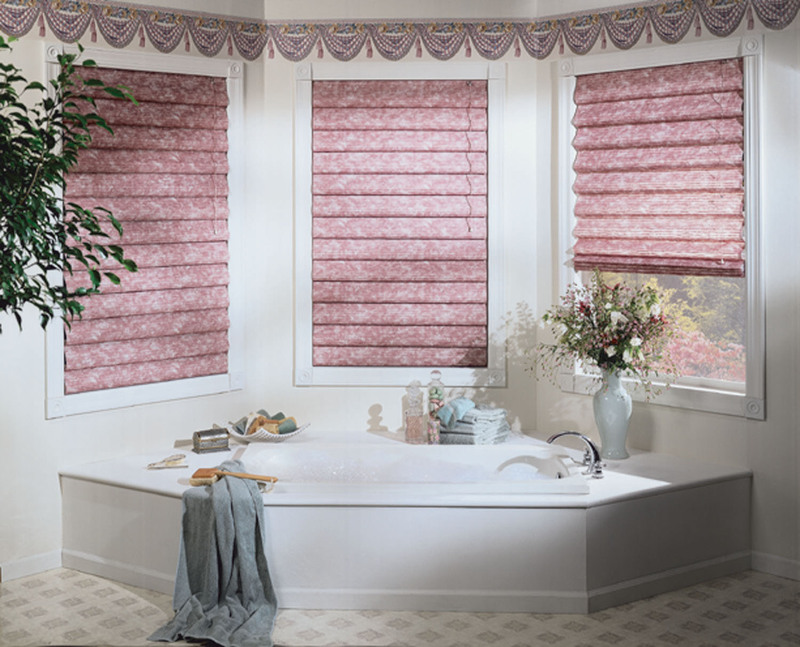 Hobble Roman shade bathroom These rose-colored hobble Roman shades really bring out the rose in the stunning accent border in this simple yet elegant corner tub setting. 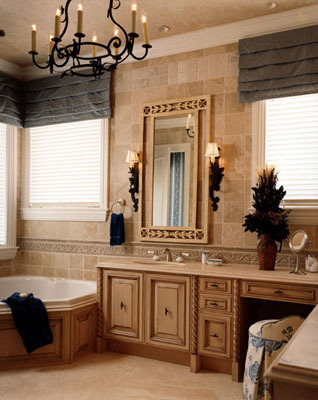 The even slighter accent of matching vase, soaps, and towels gives a gently stated subtlety to the room. What might have been harsh, stark white is now soft and graceful. Honeycomb bathroom Simplicity and elegance combine flawlessly in these combination honeycomb/sheer window panels. There is no need to add clutter or confusion to a tub setting such as this. Regulate both natural light and privacy while accenting or matching the colors of your master or guest bathroom. Sometimes understatement makes the most resounding declaration. 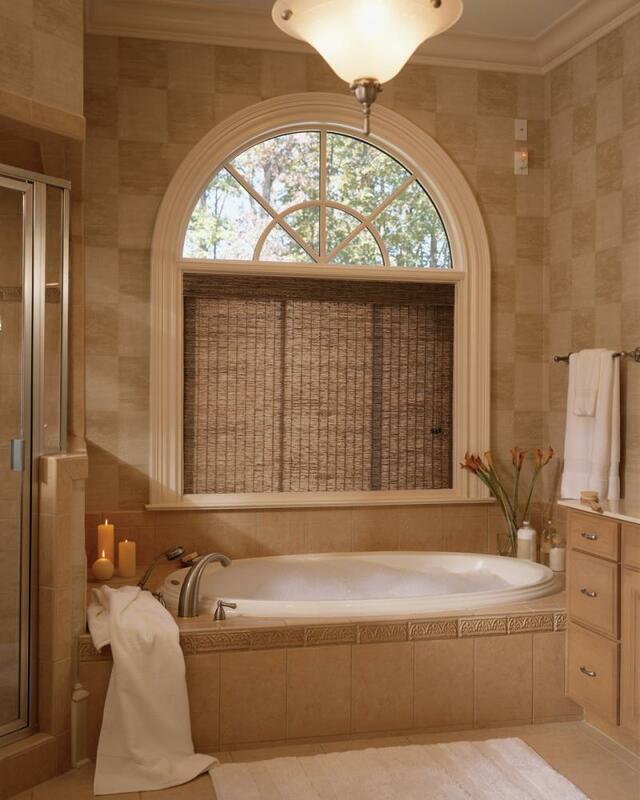 Natural woven wood shade bathroom Thanks to the gorgeous arched window and the irregularly shaped natural reeds of this woven shade, the application of this window treatment in your master or guest bathroom will provide just enough natural light by which to take a luxuriously relaxing bubble bath. Colors can be customized to either blend flawlessly or accent towels, vases and other accessories. Roman shades bathroom These slightly sheer Roman shades let in subtle natural light but provide the utmost in privacy and simplistic, yet luxurious design. Raising the shades when not in use gives your bathroom a light, airy feel and appearance. 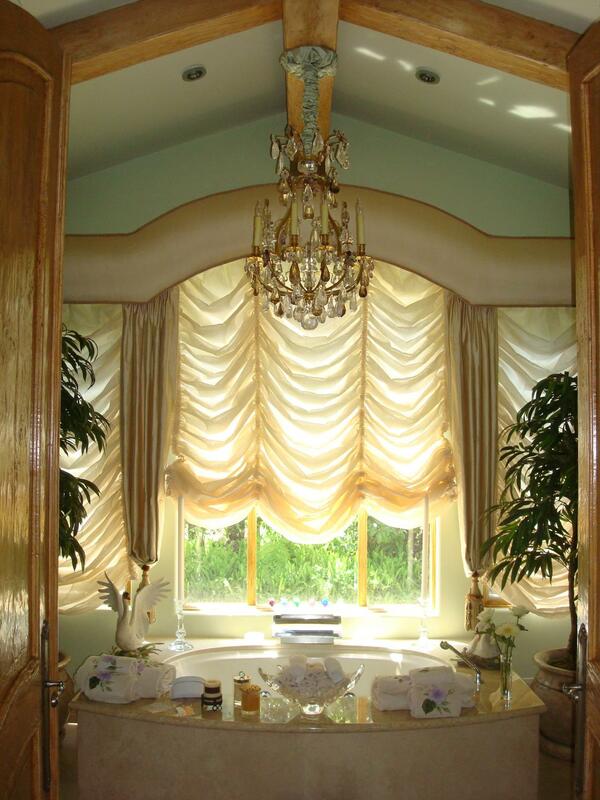 Utilize the layered cloth cornice to accompany towels, soaps, vases, wall fixtures, and vanity stools as accents. 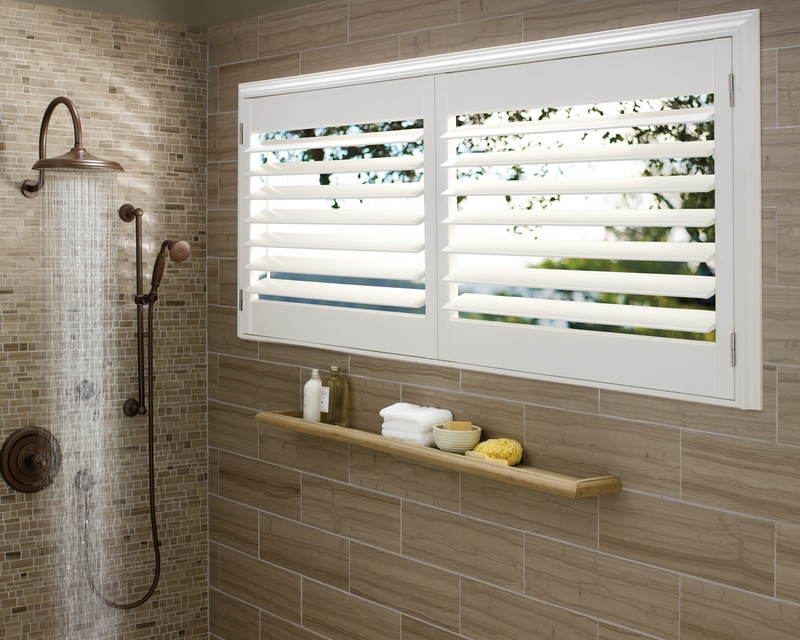 Shutter bathroom So simple yet so very classic, these shower room shutters provide the necessary privacy for use in a populated area while, at the same time, being perfect for a country setting to give the shower a wide-open, natural feel with the slats tilted up. In this situation, one can open the right shutter all the way for a truly outdoorsy atmosphere.